Climate change is accelerating, according to the latest annual climate report from the Bureau of Meteorology, with 2016 tipped to have been the hottest year ever recorded globally. according to The Australian. And because it is the BOM, no one bothers to check. In fact, when you go to some of Australia’s oldest and best maintained climate records there is precious little sign that there is any significant warming happening, and none that it is accelerating. 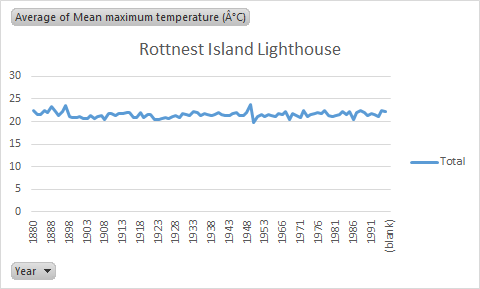 These graphs, taken from BOM data for a number of Australian lighthouses tell the story. I’ve chosen these data sets for a number of reasons. They are continuous records and have been taken from the same spot over the whole of the time of their existence. So there is no need to adjust them in any way to take account of station shifts, or the urban heat island effect. The oceans are the drivers of climate and temperature. Taking temperatures close to the coast means you are capturing a more representative sample of what is happening on earth. Inland temperatures can be effected more by things like prevailing winds, and drought or flood. 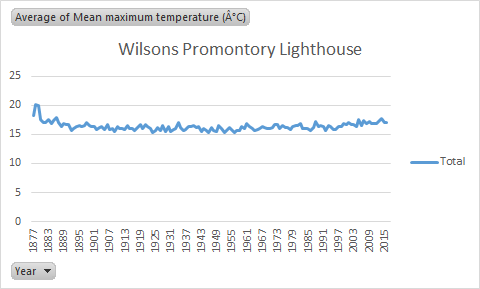 Lighthouse keepers are pretty reliable folk, or they wouldn’t be doing what they do, and as a result I think we can assume that they are probably pretty reliable when it comes to taking temperature. Probably more reliable than say postmasters, who have a lot of other things on their plate. These cover the east, south and west parts of the continent. So it is relatively comprehensive. I think given a choice between lots of bad, short term data, and relatively few, but incredibly high-quality data, you should always choose the latter. If you’re wondering why nothing from north Australia I couldn’t find anything to match my lighthouse and longevity criteria there, but as global warming is predicted to be stronger away from the equator, that is an issue of lesser importance. Sometimes an even longer view is useful for getting even better perspective. I agree Rosemary, but I guess the point I am underlining here is the instrumental record and what it says. Temperaturewise there is not a lot to worry about at the moment, based on the past, recent or very historic. The placement of weather stations is something that should be taken in account when people make dire pronouncements on the ‘hottest year eva’ etc. How many of the weather stations are located near or next to concrete – airports, in cities etc. Concrete and tarmac can get blisteringly hot during summer, and urban heat islands are a recognised phenomena. As a student of Ancient History and Archaeology I read about climatic shifts and changes and how those changes affected human populations, cultures, and civilizations. We accept that climate changed naturally in the past – yet the underlying popular (and political) narrative is that current climate is driven almost entirely by human interference, with the sun as a secondary player. This, of course, is an ideological view, not a historical nor scientific one. Your lighthouses show the last hundred years, the graphs I linked to show the last 65 million years. Agreed that there isn’t much to worry about now, but the general trend does seem to indicate cooling, and if our governments were legit about preparing for climatic shifts, then prepping for cool/dry conditions would be the sensible way forward. Firstly it would be great if you could standardise the graphs you are offering us. 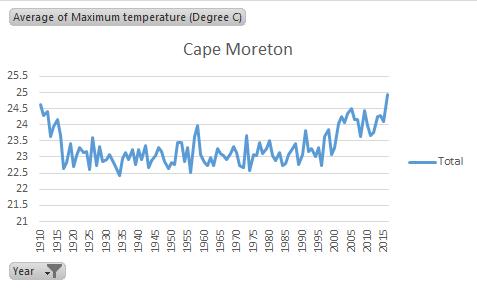 The anomalies are in the order of a couple of degrees so even the 4.5 degree range for Cape Moreton could be 3.5 as could the rest if they are taken for the last 100 years. Then we could make a better assessment of trends or lack thereof. As humans mainly land based creatures the impacts of rising temperatures will be felt far more acutely than at lighthouses experiencing the buffering effect of being surrounded by ocean waters. But ultimately mate it comes down to this. Should the conclusions you drawn about global warming from your 4 graphs ‘Trump’ those of highly experienced climate scientists who are telling a very different story drawn from enormous amounts of data? Nope and nor, on mostly any other issue, would you expect it to. We all have our blindspots myself included. This is by far your biggest. Is the data corrupted by avaricious, dishonest and dishonorable scientists who are: a. pushing a political or ideological agenda, b. blatantly chasing Government grants. Are other scientists under pressure to not go against the prevailing global warming orthodoxy because of fears of losing grants, not wanting to imperil their careers, or lose face? One thing you might want to think about is whether the whole climate change/global warming ideology will, over the next four years, fall off the radar given that President-Elect Trump indicates that scientific funding will go to other areas instead of the climate change dogma. Case in point – NASA being redirected away from clinate science and back to their original focus on spaceflight/space travel. In other words, if the funding dries up, will climate change suddenly become less popular as a focus for scientific research papers. Thanks Steele. I think your post demonstrates a number of things. A lot of amateurs want to buy into this argument and make bad assumptions. The idea that I need to “standardise” the graphs so that you can measure trends is a bad assumption. The trend is the slope on the graph. The slope will be the same, no matter what sort of “standardisation” you are talking about. 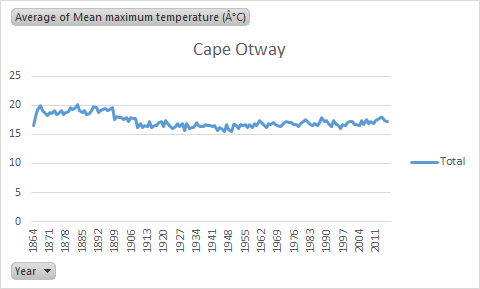 Your point that land temperatures are rising faster than sea temperatures points to a problem with measuring land temperatures. There is no reason that this should happen that is related to CO2. So either the measurements are capturing a spurious warming – perhaps the so-called homogenisation process where raw data is adusted – or the warming has nothing to do with CO2 – the urban heat island or land clearing practices. Your last point is just unscientific. I am providing a quality check by looking at long term temperature records where there are no issues with urban heat island, or land clearing practices, and where there is no need to “homogenise” the data. They indicate a problem with the official land-based records. The scientists working on these records need to revise their practices. Climate hysteria is increasing and has been for 30 years. However, the climate is always changing so the fact it is changing now is nothing unusual or threatening. Life thrives when the planets is warmer but struggles when colder. The planet is an unusually cold phase. This is only the second time it has been this cold in the past 540 Ma! An ingenious idea, Graham, with an absorbing result. Many thanks! Graham, your observations are valid. There is no scientific or economic justification for the so-called climate change action being taken by our Federal and State governments. In fact, those actions are downright dysfunctional. Whereas Australia once ranked number one in the world for lowest-priced electricity, thanks to Australia’s natural advantage in coal-fired power availability, those actions have forced up electricity prices to such an extent that it now ranks about 27th lowest. To add insult to injury, the security of electricity supply has been adversely affected by over-reliance on intermittent renewables. Major power blackouts are becoming common, so common in fact — witness those in South Australia following shutdown of coal-fired power stations, and now Victoria — that it is not surprising that industry disinvestment with consequent jobs loss is occurring. Yet, both the Federal and Victorian governments have their energy-policy heads still buried in the sand. They have the temerity to offer Alcoa a future supply solution comprising unreliable renewables for the Portland smelter that had three quarters of its capacity badly, if not permanently, knocked out by the December blackout. Which business owners in their right mind would now find Australia attractive for locating their industrial base, given its high-cost, unreliable electricity supply? Normally, a waning phase ought to have heralded the start of a new ice age, not record year on year, warmest ever records or trends? Which, it would seem has already pushed Co2 levels into uncharted territory? Now, I could understand some of the angst and countervailing arguments/conspiracy theories etc, if decarbing our economy, couldn’t be managed with a massive economic upside! As we’d get with the nation wide roll-out of tried, tested and proven thorium energy, as walk away safe, molten salt thorium reactors, that could utilize Co2/helium/nitrogen gas turbines, to entirely eliminate the need to place them near a large body of water? Given this is so, make a hugely expensive and extremely vulnerable national grid entirely redundant? To the sound of hair being torn from skulls clothing being ripped/rent and coal enthusiasts jumping from tall towers? And as they pass by each level, remark, so far so good? Yesterday, while checking out the weather channel, saw just how unreliable wind towers can be, with the blown down remains of one somewhere in Scandinavia, decorating the “renewed” landscape with its recent ruins. Thorium reactors can be buried in bedrock immediately below the energy consumers or production plant, to eliminate the up to 75% lost as transmission and distribution losses, remain impervious to adverse or extreme weather events? Just that one feature on it’s own, more than able to more than halve energy costs, which for starters, could resuscitate energy dependent manufacture and processing here in Australia? Think, Aluminum is little more than congealed electricity? Moreover, the direct reduction single step method of steel smelting invented here, would be more than viable, with (world’s cheapest) cheap, clean, safe energy for the necessary arc furnaces! And thorium based power as in molten salt thorium reactors would be the cheapest of all, with impressive built in safety features! Why isn’t everyone using it if it’s so good, so safe, so clean and so cheap? Great question and one that needs to be addressed by the various (information suppressing?) state governments/licencing authorities! Sane folk in S.A., are finally beginning to understand, it is energy prices destroying both jobs and a manufacturing based economy, not wages! We need the truth, followed by change we can all believe in and policies that prosper us all, not more BS! All you amateur climate scientists need to realise that the presence of polar ice has a stabilising influence on sea temperatures. If you take a glass, add ice to it and then fill it with water and leave it in a warm place, the temperature of the water will remain at zero degrees until all the ice has melted. Graham’s graphs prove nothing except what I have just explained. Well David, to all you amateur physicists, if you are right why is it that the sea temperature feels like a warm washing machine in Queensland, a glass of nicely chilled champagne in Sydney, and terminal hypothermia south of Tassie? Apparently it ought to be zero all over the globe until the ice melts on your glass of water analogy. That is demonstrably not true. If this were an intellectual argument that left a winner, it might be fun, a way to pass the time, or beat boredom? There are some changes even the professional cynics can’t ignore? The east coast current seems to be moving tropical species further and further south? The Kelp forests off the coast of Tasmania seem to be thinning/disappearing? And average wind speeds across the planet, but particularly, southern climes, seem to be increasing? And given the latter would seem to be a product of increased global convection? That simply can’t be happening during a solar waning phase! Something else must be causing this, cause and effect outcome? Now, if we couldn’t respond in a way that came replete with a quite massive economic upside! I’d punt for ignoring the phenomena and hope, like a warm and comfortable frog, being slowly, almost imperceptibly, brought to the boil, in a pot of heating water, it’d go away? But, there’s a massive economic upside to decarbing our economy! The first being avoiding the carbon tariffs other nations are bound to implement as a consequence of international agreement? The second being the roll out of clean cheap safe thorium energy, and energy prices so low, we can’t help but resuscitate our devastated manufacturing economy, without which we are effectively defenseless! Somewhere, at sometime, someone has to understand that shifting costs and tax liability ever downward is a zero sum game, where nobody but nobody wins! Ditto forever increasing energy costs! The only possible consequence of grimly hanging on to coal or gas as principle energy sources, even as other more intelligently led nations bite the bullet and decarb their economies? With the smartest rolling out the lowest costing examples in the knowledge, the economic upsides that come with this approach have far better economic upsides than mindless and economy harming privatization/the Emperor’s new clothes energy policies. Look the world over to find, just one example, where privatization has resulted in lower power prices/increased manufacturing output, or better, safer maintenance schedules? Just one! With accompany documentation that demonstrates the actual evidence, rather than the usual corporate blurp or government propaganda? Just one!? An intelligently led nation, would end this useless time consuming debate, and just crack on with the roll out of tried, tested and proven technology! And here I’m referencing thorium, specifically as, walk away safe, molten salt thorium based nuclear technology! Then task it with safely processing other nation’s problematic nuclear waste, and earn billions, while providing ourselves with virtually free power, for the literal centuries this approach would involve! Then use that cheapest ever energy to rebuild our economy, ensure our security, make our desert wastelands bloom and drought proof Australia! Ostensibly, to take full and complete mind-numbing advantage of the next boom! The food boom! And having done that, let the rest of the world follow our intelligent lead, if they dare, or are “allowed”? Capishe? What’s the matter you? Don’t you like money?